Climber: "I felt as if my heart was being torn out"
American's story told in best-selling book, "Three Cups of Tea"
(CNN) -- Greg Mortenson brushed his tears away. His body sagged when he saw it happen. The prize he had sought for 78 agonizing days was slipping from his view. 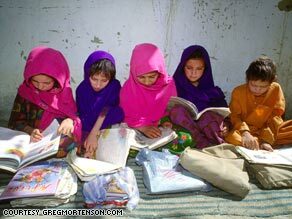 Girls, who are often discouraged from attending school, read at one of the Central Asia Institute schools. He was clinging to an icy patch of K2, the second-highest mountain in the world. He had vowed to place an amber necklace on the top of the Pakistani mountain for his sister Christa. But clouds moved in when he was 600 meters from the top, blocking his path to the summit. Now more than his vow was at risk. His life was in danger, too. His climbing party had started out with 12 men. Five would die. He was lost and alone at 25,000 feet with an empty water bottle and one protein bar. "I felt as if there was an angel holding my hand, trying to take me to the top," he said. "When I lost that hand, I decided I better go down. " What Mortenson found on his descent would test his will as much as K2. He would stagger into a remote Pakistani village, have his heart "torn out" by an unexpected encounter, and meet a girl who altered his life with one question: "Can you help me build a school?" He didn't know it at the time, but he was about to take another dangerous journey. Mortenson shared the details of that journey in "Three Cups of Tea," a best-selling book he wrote with journalist David Oliver Relin. Since 1996, Mortenson has helped build 78 schools for children in Pakistan and Afghanistan through the nonprofit group, the Central Asia Institute. The group's premise: books, not bombs, are the best weapons against extremist groups like the Taliban. "The real enemy is ignorance and ignorance breeds hatred," he said. The schools encourage girls to enroll. The ultimate goal: produce educated girls who, when they become mothers, will teach tolerance to their sons. "You can drop bombs, you can build roads, but if you don't educate girls, the society is not going to change." That message has made Mortenson popular man. He lives in Montana with his wife, Tara, and their two children, Amira and Khyber. But he's constantly on the road, giving speeches and traveling to Asia. That message has also made him a marked man. Mullahs have issued death threats against him. In the book, he described being kidnapped and held hostage by the Taliban. He's also received hate mail from Americans who don't think he should educate Muslim children. Yet he shrugs off any notion of being a hero. "I see girls walking three hours to school," he said. "I see girls who are being threatened at home by the Taliban still trying to go to school." His vision for educating girls in South Asia didn't grow out of the War on Terror. It's rooted in his childhood. It began with his father. Irvin "Dempsey" Mortenson was a strapping, Lutheran missionary who was a high school basketball and football star in Minnesota. On an impulse, he moved with his wife, Jerene, to a house in Tanzania. They lived on the slopes of Mount Kilimanjaro, the largest mountain in Africa. Dempsey Mortenson's adult life was devoted to an ambitious, philanthropic project. He spent a decade raising money and staff to found Tanzania's first teaching hospital. It was one of his father's proudest accomplishments, Mortenson said. "My dad said you need to practice your faith, not preach," said Mortenson, whose father died at 48 from cancer. His sister also inspired him. Christa was an epileptic who had fragile health all of her life. Mortenson said she would take up to an hour every night to arrange her clothes and pack her lunch so she wouldn't be a burden to her family in the morning. "She never complained," he said. "I never heard her once get angry. " Mortenson was her big brother, protector and friend. He took Christa to the Indy 500, the Kentucky Derby and Disneyland. But one of her favorite pastimes was watching the movie, "Field of Dreams." Their mother promised to take Christa to the place where it was filmed for her 23rd birthday, but she died from a massive seizure in her sleep on the morning of the trip, Mortenson said. Mortenson decided to honor Christa by climbing K2. He trained a year for the trip. He spent over two months on K2 with 11 other climbers, but he lost contact with the others and became too weak to reach the top. The K2 descent led to a life-changing encounter for Mortenson. When Mortenson was staggering down K2, he stumbled onto a Pakistani village called Korphe. The area was so remote that he said that he probably would have died if he had taken another route. Villagers rescued him and nursed him back to health. While recuperating one morning, he watched the village's children attend school. What happed next inspired him to make a new vow. He saw children sitting outside on the frosty ground, scratching out their lessons in mud with twigs. They had no school. A girl approached him and asked, "Can you help me build a school?" He describes why he was so moved by those children in "Three Cups of Tea." "I felt as if my heart was being torn out," he wrote. "... Everything about their life was a struggle. They reminded me of the way Christa had to fight for the simplest things." Mortenson told the girl that he would build a school. Fifteen years later, he has helped build 78 schools in Pakistan and Afghanistan. They are his "Field of Dreams." "I didn't know it would change my life forever," he said of his vow. He no longer has Christa's amber necklace. He gave it to his daughter, Amira, who shares Christa's middle name, Eliana. Amira keeps it by her bed. "I told her when she feels ready, she can do what she wants with it," Mortenson said. "She'll probably bring it over to either Africa or Pakistan and give it to some young girl." Though he didn't place Christa's necklace on the top of K2, Mortenson said he left a better tribute for her -- a school for girls who are just as brave as she was. "That's a much better honor to Christa than climbing a mountain," he said. "I think she would be happy. "